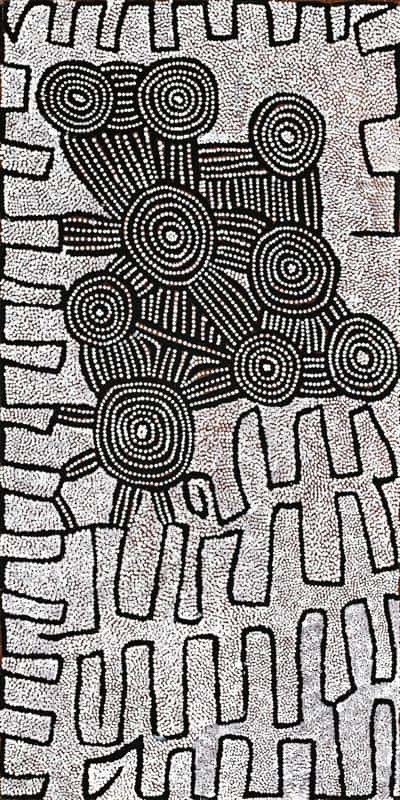 Yala Yala Gibson was one of the founding members of the Western desert Aboriginal art movement. In the early part of his career, he painted on Composition board. He is best known for his depictions of the Tingari cycle and for helping create the “Tingari” style of aboriginal art. His later works are on Canvass and maintain a high standard and exemplify what most people would consider aboriginal art. 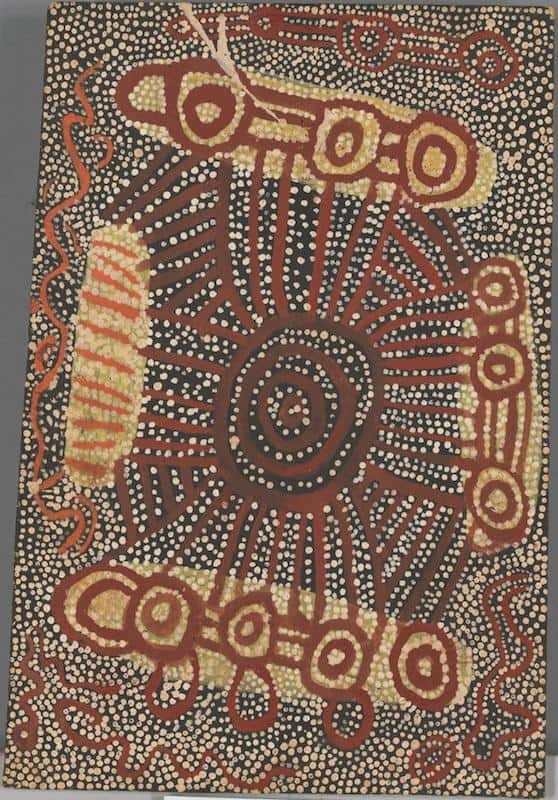 The aim of this article is to assist readers in identifying if their Aboriginal painting is by Yala Yala Gibson Tjungurrayi. It compares examples of his work. It also gives some background to the life of this fascinating artist. 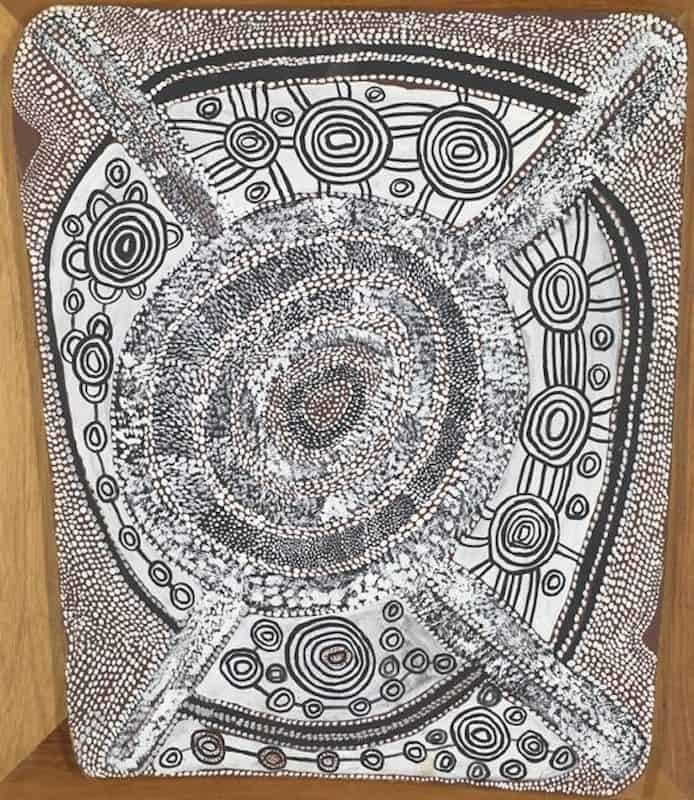 If you have a Yala Yala Gibson Tjungurrayi Aboriginal painting to sell please contact me. 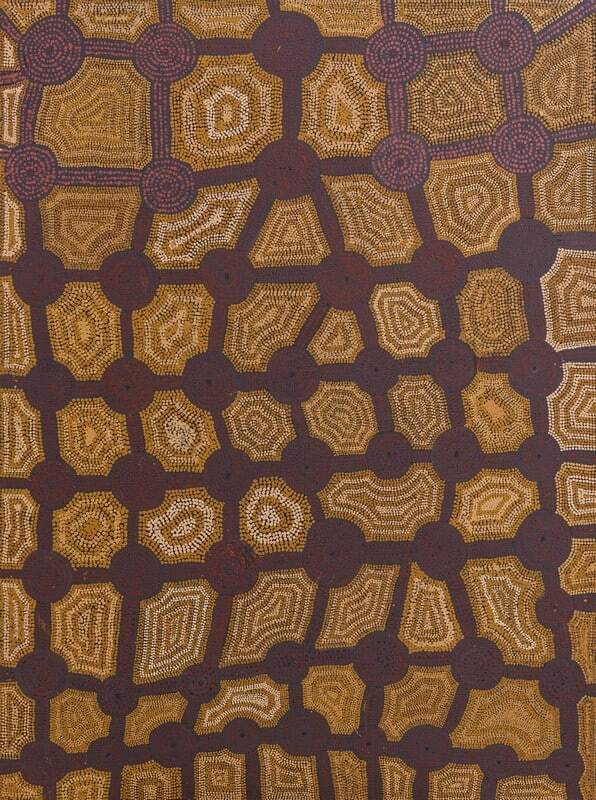 If you want to know what your Yala Yala Gibson Tjungurrayi painting is worth please feel free to send me a Jpeg. I would love to see it. Yala Yala Gibson was born around 1924 at Iltuturunga. For the first 38 years, he lived a traditional nomadic desert aboriginal lifestyle. He was initiated and married. He first left his homelands west of Lake Macdonald in 1962 with his wife Ningura Napurrula. His son had suffered severe burns and they traveled to Papunya settlement for medical treatment. He briefly returned to his homeland in 1963 as a guide for welfare patrols. In July 1963 he returned to live at Papunya where his second son was born. In Papunya, Yala Yala worked with Anatjari, John Tjakamarra, and Freddy West as a farm laborer. In 1971 Geoff Bardon became a local school teacher at Papunya primary school. He tried to encourage local children to paint in their own traditional style. When he found out only older men could paint these stories he started a men’s painting group. Yala Yala was one of the first members of the painting group. He is recorded as being a solemn man who spoke little, but who gave himself wholeheartedly to his Art. He quickly developed fine technical craftsmanship, characterized by a strong linear quality. Yala Yala was one of only six artists who received a government allowance which enabled him to paint full time in the first years of the painting movement. Yala Yala was well known for his Tingari cycle paintings. 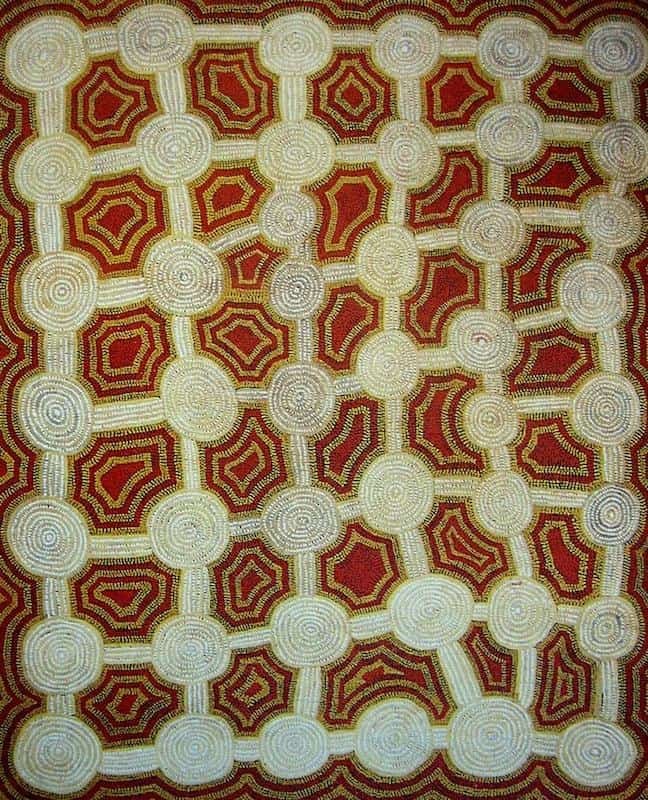 Tingari paintings are characterized by numerous concentric circles joined by traveling lines. 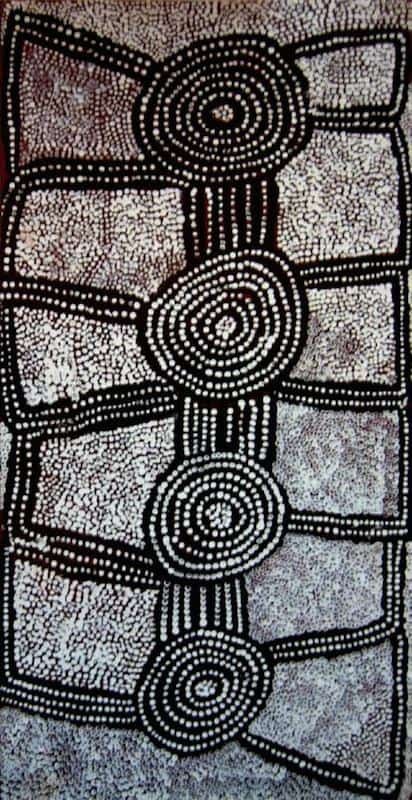 They became so popular that typify aboriginal art. 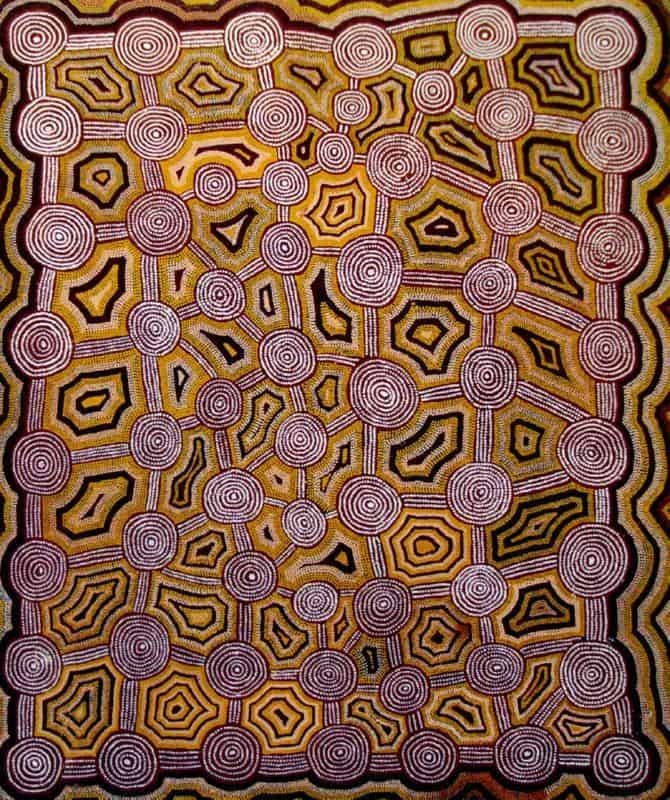 Yala Yala Tingari paintings are like vast mind-maps of his desert homeland Loops, spirals and roundels are linked by traveling lines and held in unity with, often diffuse, background dotting. He used a restricted range of ochre colors that helped convey his sense of connection to his country. For Yala Yala painting was also a spiritual activity and he and other Pintupi artists like Shorty, Uta Uta and Charlie would sing traditional chants while painting. Yala Yala along with Charlie, long Jack and Kaapa was one of the initial shareholders of a newly formed Aboriginal Art company called Papunya Tula. This company was owned by aboriginal artists and established to promote and sell aboriginal art. In 1975, forty-four out of forty-six paintings, in a Perth exhibition, were turned to the wall in response to the demands of a visiting group of Pitjantjatjara men. They were deeply disturbed by overt references to their secret beliefs and ceremonies. 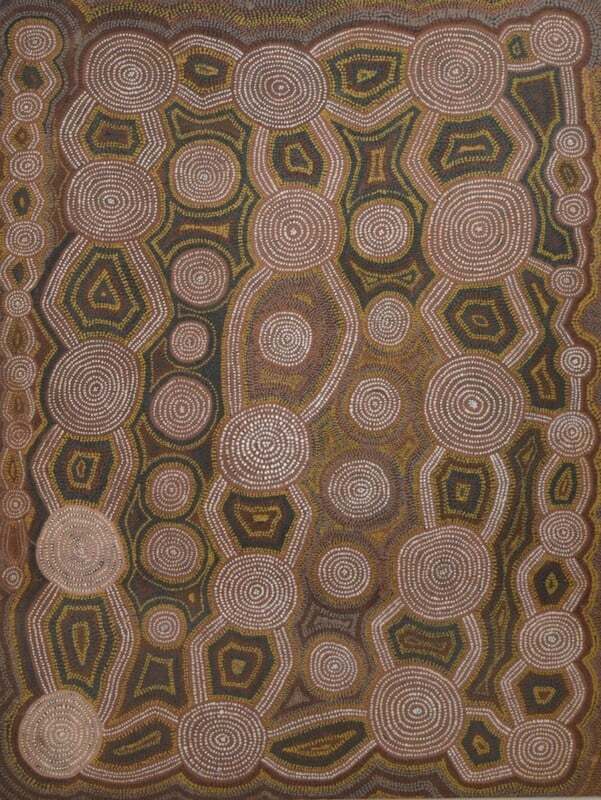 Papunya Tula painters were forced to pay compensation to the Pitjantjatjara men. Paintings from that time on were more stylized and sacred elements veiled. This force style change caused some artists like Anatjari, Kaapa and Timmy Payunka to become artistically stifled. Yala Yala though had a natural talent for conceiving uncomplicated yet arresting arrangements. His paintings along with Johnny Tjupurrula and John Tjakamarra soon accelerated to the forefront of the aboriginal painting movement. 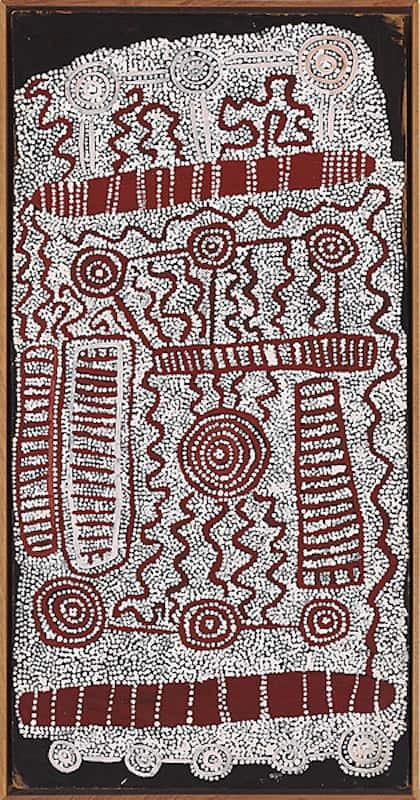 Aboriginal art became increasingly abstract and traditional design elements used and rearranged. In 1981 Yala Yala moved from Papunya to Kintore to establish an outstation at Mantardi. His art was now all on canvass and in acrylics. His art was in high demand and this was due in part to Andrew Crocker the art manager of Papunya Tula. Andrew promoted the paintings as contemporary art rather than ethnographic imagery and sold to collectors and galleries rather than museums. Yala Yala Gibsonworks were for the first time included in an exhibition of large acrylic canvases shown at the Art Gallery of NSW. In accord with market demand, Yala Yala broadened his experimentation with abstraction. He was free to develop his own signature Tingari style. By the late 1980’s Yala Yala Tingari paintings fell out of favorr with the art market. The market was increasingly embracing an ever-growing number of regional styles. He was in competition with other artists like Mick Namarari, Turkey Tolson, and Ronnie Tjampitjinpa who were producing newer more trending styles. Yala Yala’s work to a large degree remained unchanged and became stale and his popularity as an artist declined. He continued living in his outstation at Mantardi where he had close ties to his traditional lands midway between Kintore and Kiwirrkurra. He was a senior custodian of Pintupi sacred sites and knowledge, and painted devotedly until his death in 1998.